I believe, although I am not certain, that Gandolfi & Sons was the oldest camera company in existence. It was founded in 1885 by Louis Gandolfi, and his sons Arthur, Frederick, and Thomas took over in 1928. Arthur Gandolfi died in 1993 and must have been well into his nineties; I recall reading a delightful article about him and one of his brothers—I don't recall if it was Frederick or Thomas—in the 1980s, which portrayed them both as capable and active but decidedly old. I'm afraid I can't trace the fortunes of the company since 1993 for you—information about Gandolfi is thin on the web, so much so that it makes Deardorff enthusiasm look like a thriving and well-populated subculture—but in any event the current website announces that the cameras are no longer being made. This seems no more sad than my great-aunt dying at age 101; there's a natural order to such things that takes the sting off when things happen in their due course. For a craft business, a cottage business, it had a nice, long, honorable life. Here are a couple of pictures of a traditional Gandolfi. Featured Comment by Fred: "When I viewed the Gandolfi link,the beauty of that camera brought to mind the Adler and Sullivan book which I purchased after seeing your book of the week suggestion recently. The old world craftsmanship is self evident in both disciplines and their loss is lamentable." Oldest camera company? I'll mention Eastman Kodak, founded in 1880 and still in business today. (Reports of its demise are slightly exaggerated.) They made lots of wooden view cameras too, just not for 60 years or so. I don't think Kodak count as a camera MAKER any more in any significant way. A camera marketer, yes. And it was a cameramaker at various times in the past. 1. I am personally disappointed - it was one of those purchases that I was always 'going to get round to...' and now I can't - It looks as though I will have to go to Japan to find my Large Format beauty instead - or maybe one of those beautiful Lotus's from Austria. 2. Today's students increasingly lack the discipline of shooting sheet film - a couple of dollars a pop concentrates the mind like nothing else - meter twice, click once to paraphrase the old carpenters mantra! Wrong, Mike, when a company dies that makes handcrafted goods its always sad. Handcraft is what we are gonna need in the near future, and harder then you or anyone might imagine. And when I see the Gandolfi it is a beautiful tool, build by someone who addored his craft, who went to work everyday in order to give it the full 105% in order to stand up to the quality needed in order to create a functional object of beauty. Who went home in the knowledge that he had achieved something to be proud of. I wonder how he (or she) felt when the last Gandolfi was made and the work was finished and he could retire or go on the dole. Did he shed a tear? And if a grandmother of 101 dies peacefully isn't she missed? A loss is a loss Mike, no matter how econimically understandable, or whether it (or in the case of the grandmother, she) has passed its (or hers) sell by date by far. That said, because of my background, when I read these stories, I always think: "...this isn't anything more than an advertising problem...". i.e., with the correct promotion and all (and the correct training for new staff), they could have still been viable. People are still buying very expensive Ebony's and such (and Leica's). I always laugh when people say: "...you don't want to be in the buggy-whip business in this day and age...", when of course, people still make damn fine buggy-whips, expensive too, and someone is buying them! Someone needs to write the full history of Gandolfi (and Deardorff!) before all the oldsters start to disappear! I emailed him two weeks ago about a used Whole Plate Gandolfi listed on the website, but never got an answer. Now I know why. It's sad. I had to check but yes this beat out Linhof by two years as they, Linhof started in 1887 so now they are the oldest still in production. Ian Irving's 2006 post on the Large Format Photography Forum gives a lot of information on the firm and the documentary made about it. Are those really the best pictures you can find on these art objects? Sad to see such works of art so poorly documented, looks like a portrait done at Walmart. Keep looking, there's got to better. 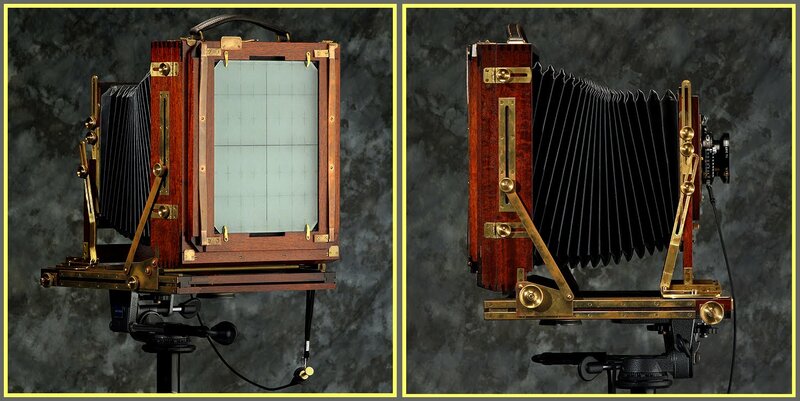 Obviously the biggest imperfection in large format cameras seems to be their lack of built-in obsolescence. Even the earliest models are perfectly usable today. They travel through time making their own production unnecessary. I too looked at that whole plate camera, inspired by your whole plate purchase Mike. By the way, any results yet, I'm very keen to know how you got on? At least the torch of pride in craftsmanship has been passed on and is amply reflected in the Canon X00/Rebel/Kiss series of built-to-last (10 minutes) gems. Voigtlander were formed in 1756 and even though an Optical company at the time, I still consider them to be the oldest camera related company and still trading!